Acrylic – lowest cost. Acrylic is a synthetic fiber blended with other fibers to simulate the look of wool. Afghanistan – A country east of Iran and northwest of Pakistan, and has a strong tradition of rug-making. Afshan – Persian translation for “scattered,” afshan rugs typically have an all-over design. All-Over-Design – A pattern that repeats and covers the entire area of the rug. This type of rug will not have a center medallion. Antique – An antique rug is at least 80 years old. Arts and Crafts – A decorating style that emphasizes handiwork and craftsmanship. It began in the early 20th century. Also known as Mission or prairie-style. Art Deco – Popular during the latter 1920s and early 1930s. This style originated in Paris, France and is known for its geometric patterns, angular shapes and bold colors. Art Nouveau – Originating in Paris, France, art nouveau is a decorating style that was popular during the 1920s. In French, art nouveau means “new art” and is defined by organic and flowing lines. Aubusson – Aubusson rugs were originally flat-woven tapestries made in France. The designs are now mostly made in China and India and are hand-carved, creating an embossed look. They traditionally have a Victorian look and feel. Backing – The underside of the rug can be made from many types of materials, including wool, cotton or synthetic fibers. 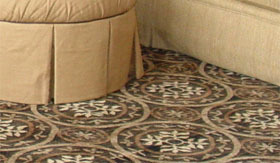 A rug may contain both a primary and secondary backing. Bokhara – Bokhara rugs were named for a city where tribal rugs were sold. These rugs have a geometric pattern with a gul motif repeated in the field. Boteh – Boteh means “bush” in Persian. A boteh is a pear-shape symbol used to represent a bush, fire, pinecone or leaf. Caucuses – The Caucuses mountain region in southern Russia is known for its nomadic, country rugs. Chrome – Chrome is a chemical that is used to make modern synthetic dyes. Coir – Coir is the fiber taken from coconut shells and used to make natural fiber rugs. 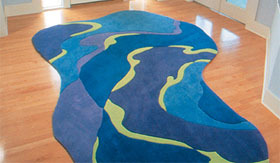 Colorfast – A rug made with colorfast yarn has stable colors and will not run together when washed. Comb – A weaver uses a comb-like tool to straighten and align knots during the knotting process. Contemporary – Generally considered a futuristic look or a look that is the opposite of traditional. Cotton – Cotton is a plant-based fiber used for flatwoven rugs and reinforcement in pile rugs. Curvilinear – Patterns in a rug that feature curves. Usually floral motifs and scrolls are curvilinear. Cut pile – When the yarn is cut, the ends of the yarn form the rug’s pile. 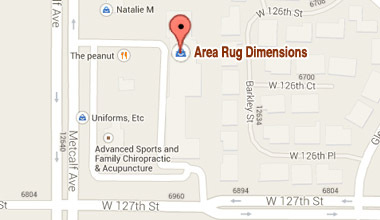 Density – The density of a rug is measured by counting the number of knots in a square inch. The higher the density, the higher the rug quality and price. Derclon – A synthetic yarn. Dhurrie – Originating in India, a dhurrie is a flatwoven rug made of wool and/or cotton fibers. Dye – A liquid color is either a natural or synthetic dye that is used to color fibers. Farsi – Farsi is the native language of Iran. Fiber – Area rugs are made using either natural or synthetic fibers, which determines the durability of the rug. Natural fibers such as wool provide soft, low-luster colors and long-term durability. Synthetic fibers provide brilliant colors, softness, easy maintenance and value. Flatwoven Rug – A flatwoven rug is made of plant or animal fibers and has no pile. Flokati – A flokati rug is a thick rug with extremely long pile. Authentic flokati rugs are made in Greece. French Provencal – French Provencal is a country style of decorating from France that features bright colors, floral prints and painted wood furniture. Fringe – Fringe is a border of threads that prevents the yarn from unraveling. Sometimes fringe is attached later for aesthetics, rather than as a functional feature. Fringe may or may not be factored into the total size of the rug. Geometric Pattern – A geometric pattern in a rug features straight lines and angles. Gul – The gul motif (or gol) is a squatty polygon design, which is usually arranged into rows in the field. It also is called the “elephant’s foot” because of its shape. Hand Carving – Hand carving is a specialized skill that entails cutting the rug pile to various lengths to create an embossed look and feel. Hand Knotted – To create a hand-knotted rug, a weaver individually ties thousands of knots to create the design of the rug. Hand Tufted – A hand-tufted rug is made by hand with a tufting gun that is put into a pre-marked canvas. 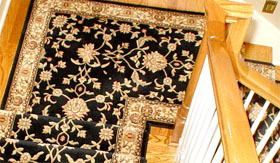 All hand-tufted rugs are held together with a backing called a scrim. Hand Hooked – Hand-hooked rugs have the look of embroidery. Yarn is punched through the canvas using a special tool. Latex is placed on the back to keep the yarn in place. Herati – Herati means “fish.” This motif consists of a flower inside of a diamond shape, with curving leaves or flowers around the outside of the diamond. Heriz – Heriz is located in Iran, and is one of the cities most famous for rug production. Indigo – An indigo plant produces a natural dye. Iran – Known as Persia until 1930, Iran is famous for the many rug designs that have originated from this region of the world. Isfahan – Formerly the capital of Persia, Isfahan was at center stage during the golden age of rug making in the 16th and 17th centuries. India – India is one of the world’s largest exporters of handmade and machine-made rugs. Indoor/outdoor rugs – These types of rugs stand up to the elements of the outdoors, but are best used in covered areas. Iron – Iron produces blacks and browns in naturally dyed wool. Jufti – A jufti knot is a simplified knotting technique. The weaver ties a jufti knot over four warps, rather than two. Jute – The jute plant is used to make natural fiber rugs. Kilim – A kilim is a flatwoven rug that is typically made of wool. Knife or Hooked Knife – A weaver uses this tool after securing the weft to the warp threads so that it shows on the face of the rug. Knot per Square Inch (KPSI) or Knot Density – Knowing the knot density is a way to measure rug quality. KPSI is how many knots are in a square inch. KPSI ranges from approximately 40 knots to more than 2,000. A KPSI of 100 to 160 is considered to be excellent. Larkspur – Larkspur produces the color yellow in naturally dyed wool. Loom – Either vertical or horizontal in nature, the loom is the first tool a weaver needs to make a rug. The warp threads are initially pulled taut to a loom to ensure that the rug is straight when finished. Madder – A madder plant produces red or orange natural dye. Machine Made – A machine known as a Wilton loom and power loom, produces a machine-made rug. Mat – A mat rug measures 2×3 feet. Medallion – A medallion is a round, oval or multi-sided motif used in the center of the rug. The medallion should not be covered by furniture. Motif – A motif is a symbol or design that is used once or many times in a rug design. A motif generally has tribal or cultural meanings. Modern – No matter what the year, the modern style of decorating always has a “futuristic” feel to it. Clean lines and simple use of color identify it. Nap – The cut pile of a rug makes up the nap. Depending which direction you view the rug, the nap can cause the rug to look darker or lighter. Natural Fiber Rugs – Made of sisal, jute, seagrass, coir or bamboo, natural fiber rugs are often used in casual settings such as a porch or family room. Nepal – Specifically from a rug dealer’s perspective, Nepal is a country that produces what used to be known as Tibetan Rugs. New Zealand – Generally considered to make the best wool and is the world’s largest wool exporter. Nomadic Rugs – Rugs that are woven by sheepherders and are generally smaller than city rugs. Nylon – Nylon is a man-made material and is extremely strong. It does not absorb moisture, resists abrasion and has an elastic quality. Olefin – A Low cost form of polypropylene and does not clean very well at all. Olefin area rugs are lightweight and inexpensive, but do not hold up well in high-traffic areas. Oriental Rug – Strictly defined, an Oriental rug is one that is hand knotted in Asia. This category includes Persian rugs. Patina – Mostly an aged or faded look. Pakistan – Pakistan is the fourth largest exporter of handmade rugs in the world. Pazyryk – The Pazyryk rug is thought to be the oldest known rug, created in approximately 1000 BC. Persian Rug – A Persian rug is one that is made within the borders of Iran. Persian Knot – A Persian knot is also referred to as a Senneth knot. This knot is asymmetrical, and is used in Iran, India, Turkey, Egypt and China. Yarn is wrapped around one warp thread, then passed under an adjacent warp thread. Pile or Nap – The individual strands of fibers that stand upright form a rug is called pile. Polyester – A synthetic fiber. Has a low melting point so will melt fast if you leave a vacuum running on it very long. Polypropylene – Polypropylene is also known as olefin. It is highly resistant to moisture, mildew and abrasion. It is a strong fiber, colorfast and quick drying. Polypropylene area rugs are lightweight and inexpensive, but do not hold up well in high-traffic areas. Prayer Rug – A prayer rug is a small rug that often has a temple-like motif that Muslims face to Mecca when praying. Rayon – Rayon is a man-made material that resembles silk. Rayon will melt if exposed to an open flame. Rugophile – A rugophile is a person that collects hand-knotted rugs. The collectors typically are concerned with the investment value of the rug, and are particularly interested in a rug’s origin and design, that the wool was dyed naturally and that it has a good KPSI count. Runner – A runner is a long rug that measures two to three feet wide and seven to 14 feet long. Sarouk – Sarouk is a city in Iran and is known for its distinctive floral design. Scatter – A small rug like 2 x 3, 3×5 or 4×6 feet. Scrim – A scrim is the backing of a hand-tufted rug, which holds the yarn in place. Seagrass – Very durable. Seagrass rugs cannot be cleaned and can’t be exposed to the elements. Semi-Antique – A semi-antique rug is 50 to 60 years old. Selvedge – The finished edges of a rug is called selvedge and prevents unraveling. Silk – Real silk is made from silkworm cocoons. China is most noted for its silk production. Sisal – Sisal is a fiber made from the Sisalana plant. 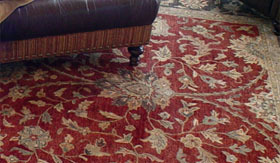 It is the strongest material for natural fiber rugs. Sheen – Sheen is the reflective surface atop of the rug that adds beauty. South Korea – South Korea is a country known for its high-grade wool production. Spandrels – The spandrels are found in the four corners of a rug; typically they are used with a medallion rug design. Symbols – Symbols or motifs in rugs depict plants; animals and humans have special meaning and represent the weaver’s culture or heritage. Synthetic – Synthetic fibers are not made from natural sources. Synthetic fibers may include: Derclon, nylon, olefin (also known as polypropylene), polyester, rayon, acrylic or a blend. Tertiary – Tertiary colors are those created by combining primary and secondary colors. Tibet – Now part of China, Tibet has a rug making tradition that dates back thousands of years. Rugs from this area often resemble Nepalese rugs. Transitional – Transitional is a broad category to define the style between traditional and modern. Tribal Rugs – A nomadic group makes tribal rugs. These rugs tend to be small. Tufting Gun – A tufting gun is a tool used to push the yarn back and forth through the backing of a hand-tufted rug. Turkey – Turkey is a country that exports many hand-knotted rugs and is known for its geometric designs. Rug motifs often resemble those made in the Caucasus region. Turkish knot – In a Turkish knot, the yarn is tied around two adjacent warp threads. Also known as symmetrical knot and ghiordes knot. Twist – Twist is the amount of yarn spirals: the tighter the twist, the tighter that yarn and durability. Vegetable Dyes – Vegetable dyes are natural and are derived from insects, madder root, indigo, milkweed, pomegranate, osage, cutch and cochineal. Warp – The threads that are stretched lengthwise on the loom. Weft – The threads that are horizontally woven through the warp threads. Wilton Woven – A special machine-operated loom. Wool – Sheep’s hair and is made into yarn for making area rugs and oriental rugs of all types. There are many different qualities of wool.